NASA’s Dawn spacecraft has set sail to Ceres – one of the most intriguing objects in our solar system. Ceres is the largest object in the asteroid belt between Mars and Jupiter, containing a third of all the mass in the asteroid belt. The unmanned Dawn spacecraft is scheduled to arrive at Ceres in early 2015, and will hopefully shed provide new insights not only on Ceres itself, but also the asteroid belt and the solar system. 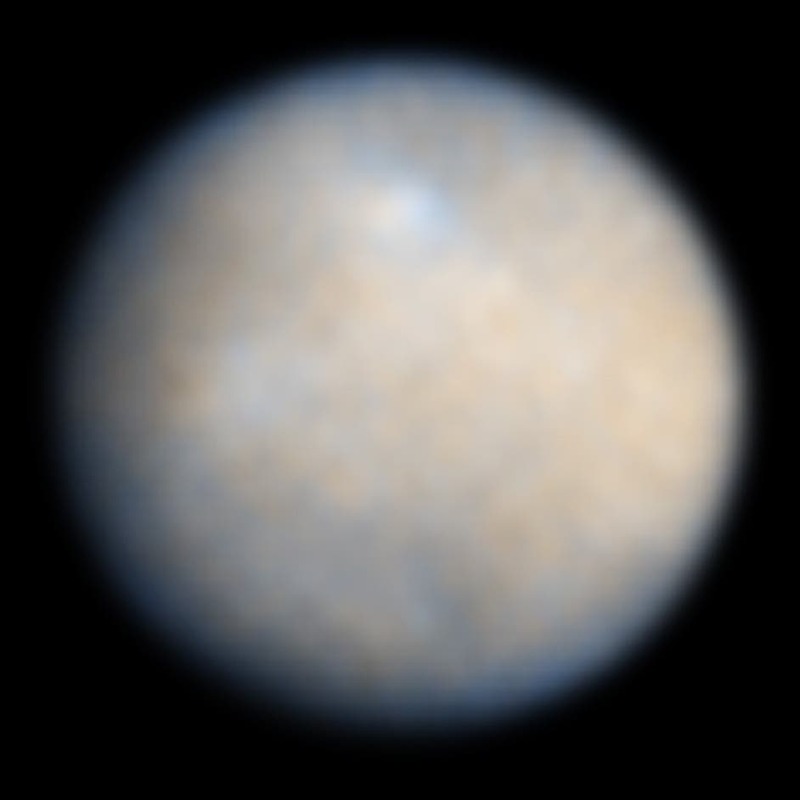 Ceres as seen by Hubble Space Telescope (ACS). The contrast has been enhanced to reveal surface details. The asteroid belt is a very accurate name – it represents the place between the orbits of the planets Mars and Jupiter, occupied by numerous irregular bodies, called asteroids. But among all these asteroids, Ceres alone is considered a dwarf planet – an object the size of a planet (a planetary-mass object) but that is neither a planet nor a moon or other natural satellite. Ceres has a diameter of about 950 km, and to put it bluntly… we don’t really know what it is. Ceres is probably a surviving protoplanet (planetary embryo), which formed 4.57 billion years ago in the asteroid belt – this is the main theory. In 2014, Ceres was found to have an atmosphere with water vapor, confirmed by the Herschel space telescope, which adds even more mystery to Ceres. Vesta, the second largest object in the asteroid belt is also a point of interest. “These two bodies are much more massive than any body yet visited in this region of space and are truly small planets,” the Dawn mission team, at NASA’s Jet Propulsion Laboratory (JPL), wrote in their mission statement. Studying these objects could also tell us more about our solar system – no matter what’s there, it’s almost certainly unchanged since the early days of the planetary formation. 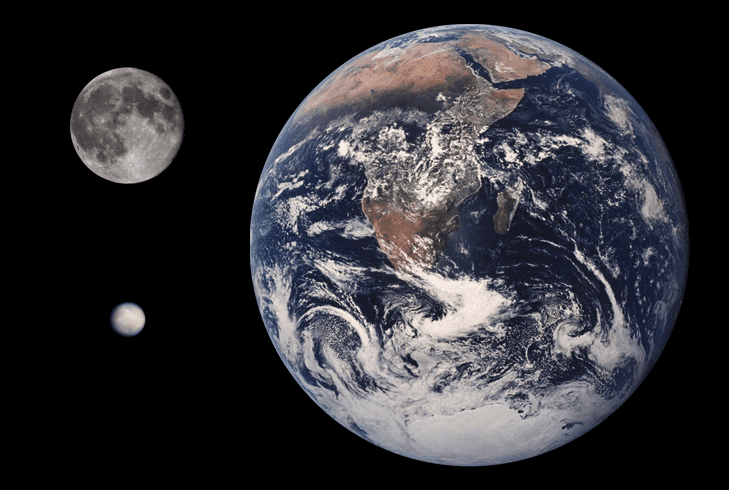 Ceres (bottom left), the Moon and the Earth, shown to scale. Image via Wiki Commons. “When Dawn visits Ceres and Vesta, the spacecraft steps us back in solar system time,” the JPL team said. In 2007, Dawn paid a short visit to Vesta, and found a dry and metallic wasteland. Astronauts are expecting quite a different story with Ceres – maybe even some water under the icy surface, though that’s highly debatable. Whatever it is, the good thing is that we’ll have a chance to study.